DOG DIGS IRON BONE! SURPRISE, SURPRISE! What starts as the best find since the great Gold Rush ends with more wobbles than the Great Earthquake. Follow the adventures of One, Two, Three, Four and Five and their cloth dog, Ragamuffin. 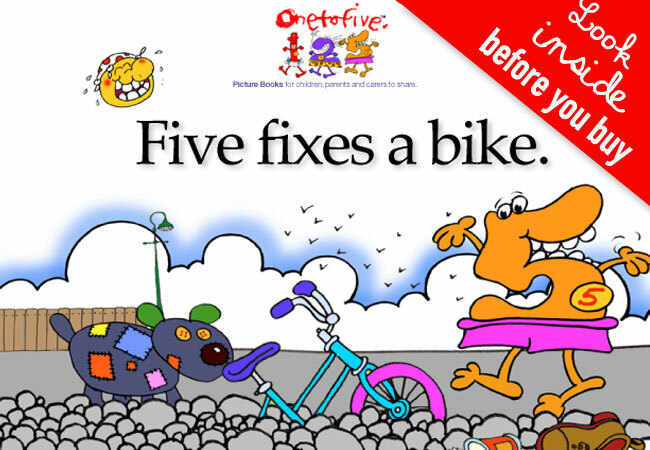 Take a sneak preview inside all my 1 to 5 kids books online at Amazon. It’s a great introduction to all the fun characters of my 1 to 5 birthday books. GrangeCalveleyShop packed with birthday goodies delivered to your door. Shop now! ‘When Roobarb made a spike’ was my 1973 pilot film that led the way to the now famous animated Roobarb BBC television series. The wobbly green dog first bounced onto Britain’s TV screens in 1974 and within two weeks of its debut on BBC TV, the show had attracted a regular seven million viewers – adults as well as children. These wonderful books written and illustrated by Grange Calveley, tell the tales of five birthday chums. There are five Birthday Books to choose from. Order your Birthday Book now! The Roobarb series success led the way to a new series, Roobarb and Custard Too that debuted on channel Five in 2005. ‘Read all about it ’ in my book ROOBARB – An illuminated biogwoofy. The Grange Calveley store is packed with birthday goodies for kids aged 1 to 5. From cards to mugs, badges to tshirts and more. The new Apple iBook, ROOBARB An illuminated biogwoofy – Grange Calveley tells how ‘Real Dog Roobarb’ escaped from prison, how his antics inspired Grange Calveley to write the hit British television series. Packed with lots of ’behind the scenes’ snippets, illustrations and photos, this newly edited book is the complete read for Roobarb fans young and old. Grab your digital copy now! Nutty Noah, Captain of the SkylArk consults his map and randomly picks out a place to visit with a dart. The SkylArk then travels to its destination on land, by air, on the sea or underwater. Each plot finds the SkylArk's crew discovering a bunch of odd characters (such as talking money) – always moaning about a problem. Every story sees Noah's wife Nelly solving the problem with her knitting skills. Noah and Nelly in SkylArk Witty scripts by Grange Calveley, narrated by Richard Briers and directed by Bob Godfrey. Completely mad and no doubt before its time. Welcome to the Grange Calveley website, my allotment in space. This is where I grow all my ideas. I have seed trays bursting with new ideas and I enjoy exhibiting the pick of my old favourites, Roobarb and SkylArk - both slightly faded now but still a good harvest of fun. Anyway, please come in have a dig around. © 2019 Grange Calveley. All rights reserved.